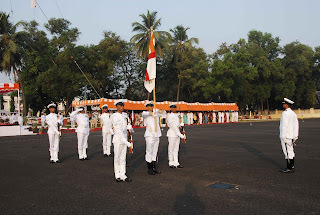 Pic 2&7 The President's Colours on Parade during Republic day at the Naval Base. 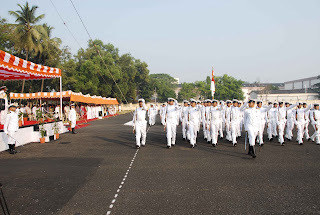 Pic3 The Republic Day Ceremonial Parade in progress at Southern Naval Command. Pic5 The President's Colours accompanied by the Guard, marching past the saluting dias. Pic6 The Southern Naval Command Band on Parade. 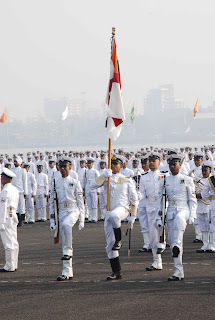 The Southern Naval Command celebrated the 60th Republic Day of the Nation in the traditional manner and grandeur befitting the occasion. 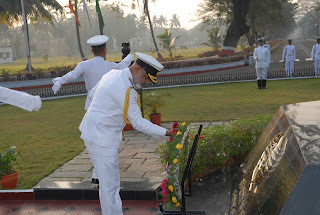 The ceremonies commenced with the laying of Wreath at the War Memorial by Vice Admiral KN Sushil, Flag Officer Commanding in Chief, Southern Naval Command. 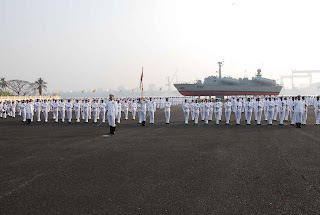 Thereafter the Admiral reviewed an impressive Ceremonial Parade at the Command Parade Ground. 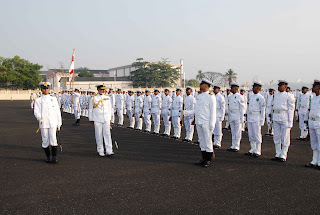 The President's Colours awarded to Southern Naval Command was also paraded. 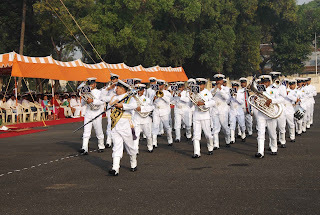 36 armed and unarmed platoons participated in the Parade along with the Southern Naval Command Band. Vice Admiral in his address to the Parade recalled the giant strides the Nation has achieved and exhorted the men on Parade to be ready to face the challenges the Nation faces. All the Warships in harbour were "Dressed Overall "– the practice of adorning the warships with flags and ensigns- in keeping with the maritime traditions on such important occasions.